Continue reading Contribution of DNA-based diagnostic methods to the treatment of coccidiosis in poultry. What’s New? Eimeria immunogenicity, basic information and protection conferred by a precocious line of Eimeria necatrix. 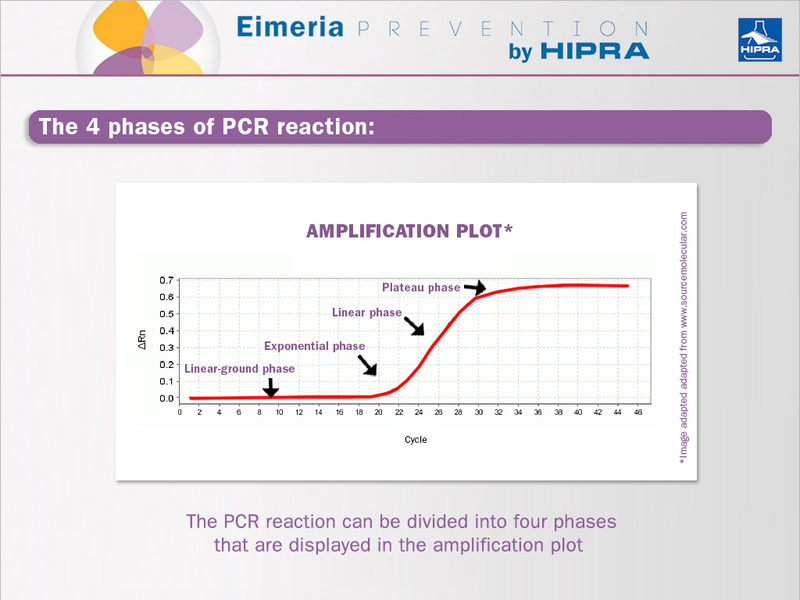 Eimeria spp is a protozoan parasite with a complex life cycle and so is the host immune response to Eimeria infection. In the last decade, huge progress has been made in the identification of host and parasite genes involved in immunogenicity but there are still some immunity mechanisms to be discovered. As a general rule, we say that Eimeria immunity is species-specific, meaning that each species of Eimeria is able to stimulate protective immunity against itself. Although some studies suggest that partial cross-protection can be achieved (Augustine et al. 1991), from a practical perspective we have to assume the widely accepted belief that there is no cross-protection between species. Continue reading Eimeria immunogenicity, basic information and protection conferred by a precocious line of Eimeria necatrix. Continue reading Can we enhance pecking and preening for oocyst ingestion in coarse spray vaccination against coccidiosis? 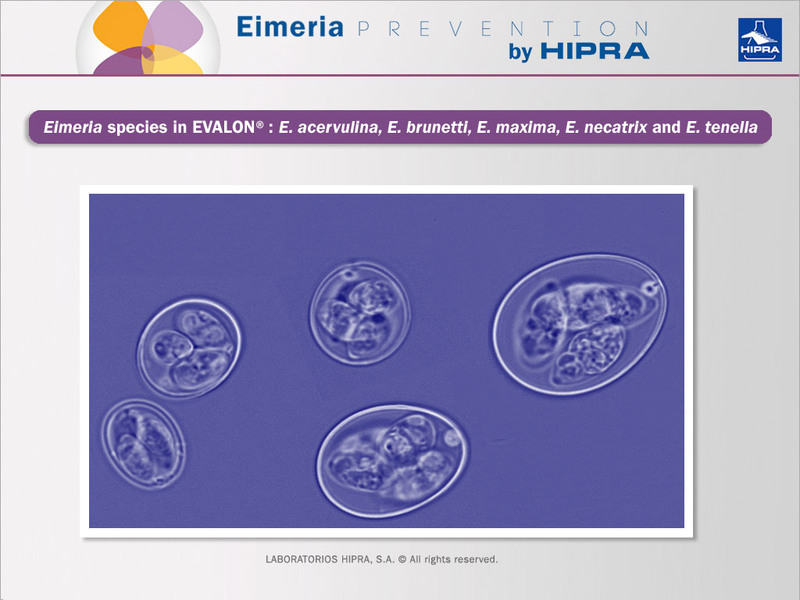 Microscopic picture of the five Eimeria species included in EVALON®: Eimeria acervulina, Eimeria brunetti, Eimeria maxima, Eimeria necatrix and Eimeria tenella. Chickens are susceptible to seven Eimeria species, the most common species affecting long-life birds being Eimeria tenella, Eimeria necatrix, Eimeria brunetti, Eimeria acervulina and Eimeria maxima. 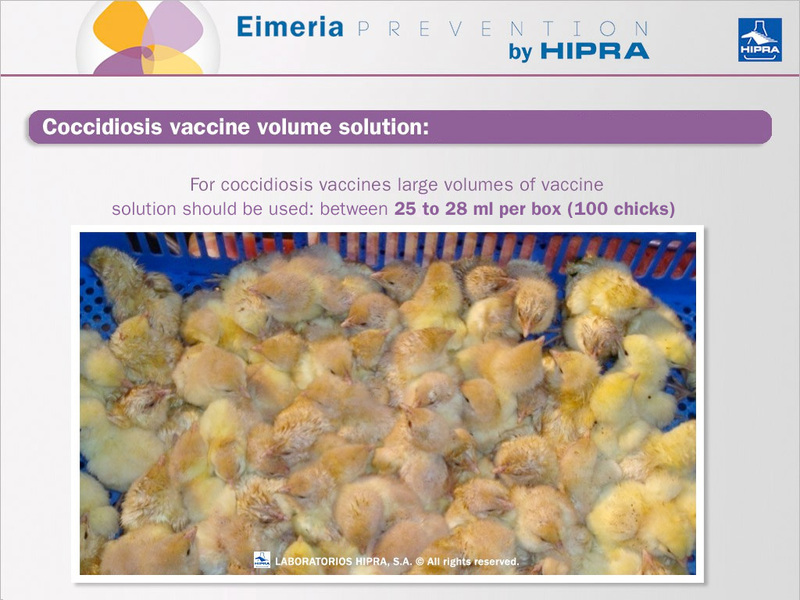 When we think about the prevention of coccidiosis in chickens raised for a long cycle (breeders and layers) we cannot imagine any treatment other than vaccines. Apart from cost considerations, the use of coccidiostats has been always a handicap in birds that usually have restrictions on feed consumption. This is the reason why the protection conferred by a vaccine applied in the first days of life should be high enough to give a level of immunity that is able to protect them throughout the cycle. 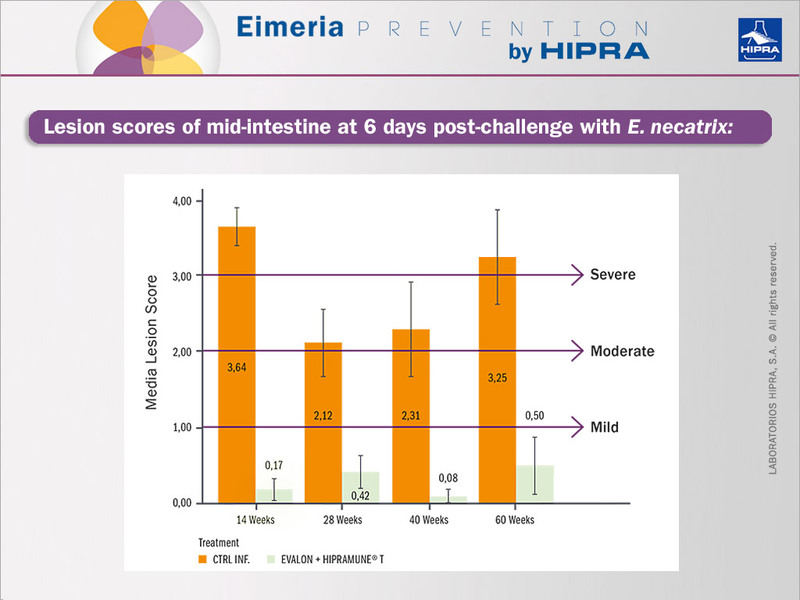 Lesion scores of mid-intestine at 6 days post-challenge with E. necatrix. Lesion scoring grading 0-4 according to Johnson and Reid, 1970. Control vs EVALON® + HIPRAMUNE®T. Layers and breeders have a production cycle of not less than 60 weeks in most cases. One of the main characteristics of these birds is that the rearing period in a normal poultry house is different to that in a production house. With the currently increasing problems of drug-resistance and pressures from consumers to ban drugs from animal feeds, there is a pressing need to move away from chemotherapeutic control of coccidiosis towards vaccination. 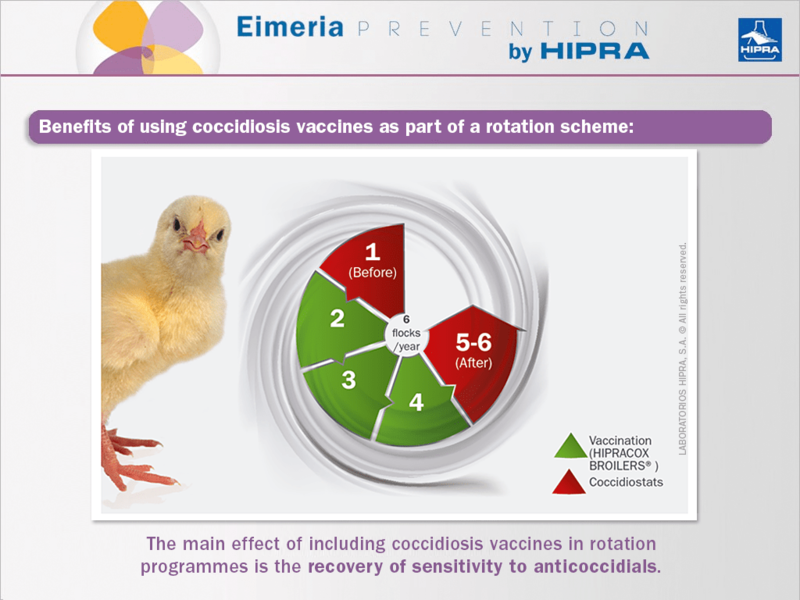 Most commercially available coccidiosis vaccines contain live oocysts of non-attenuated or attenuated strains of different Eimeria species, with the attenuated commercial vaccines produced using different attenuation methods. As the world’s poultry production continues to grow, so do concerns about the control of Eimeria infections that cause coccidiosis, which remains one of the most commonly reported diseases of chickens. The ubiquity of chicken Eimeria precludes eradication so the key role in control of the disease is played by hygiene, anticoccidial drugs and vaccines.